Total training has kindly provided us with some links to clips from their brand new training videos for Photoshop CS3. Here's a taste of what their new training videos have to offer. A quick look at customizing the menus in Photoshop CS3. In this video tutorial you will learn how to find what's new in CS3 using a special workspace menu, how to work with the Keyboard Shortcuts and Menus control panel, and how to individually colorize a menu item. 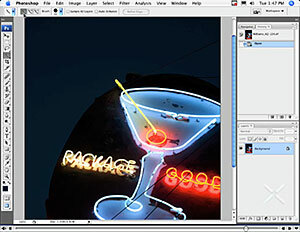 Here's a quick intro to creating a web photo gallery in Photoshop CS3. In this video tutorial you will learn how to work with the Web Photo Gallery dialogue box, how to set the banner preferences, and how to set the various image and thumbnail preferences. A quick intro to recording actions in Photoshop CS3. In this video tutorial you will learn how to record a few steps of an action as an example, how to work with the Actions Panel, and how to record the positioning of objects in an action. A quick look at how to crop and straighten photos in Photoshop CS3. In this video tutorial you will learn how to use Photoshop's automation features to crop and straighten, how to prepare images when scanning to create better selections, and how to rotate photos manually. A quick intro to recording actions in Photoshop CS3. In this video tutorial you will learn how to build an action from scratch, how to call up and work with the New Action Dialogue Box, and how to check the steps of the action to make sure that everything was done correctly. Coupled with Recording Actions In Adobe Photoshop CS3, Part 1, this is an excellent introduction to working with actions. Using Photoshop's blending options to extract an object in a graphic. How to use the Blend If sliders in the Layer Style control panel. How to split the sliders to make a more accurate attempt at removing color. How to create a new channel. How to create a channel mask by using the image adjustment features. How to work with curves and levels to mask an image. How to control the size of the tool. How to control the harshness of the tool. How to work with the Auto-Enhance feature. How to navigate the Refine Edge dialog box. How to work with the Refine Edge mask preview tool. How to modify your selections by using the Contrast, Radius, and Smooth sliders. A quick look at how to use your Wacom tablet to collage images together in Photoshop CS3. You'll learn how to add a layer mask and work with the layers palette, how to blend images together using a pressure sensitive pen, and how to create nice soft transitions in the images for a better collage effect. A quick look at the timeline and frame animation features in Photoshop CS3 Extended. In this video you'll learn how to create a countdown clock animation by using the frame animation features and the timeline animation features of Photoshop CS3 Extended. A quick look at how to work with the Vanishing Point filter in Photoshop CS3. You'll learn how to familiarize yourself with the Vanishing Point features, how to create a new plane in the Vanishing Point filter, and how to tweak the handles to make perfect planes in Vanishing Point. A quick look at how to work with smart filters in Photoshop CS3. You'll learn how to create a smart filters mask, how to use brushes to work with an image, and how to paint out areas of an image. A quick look at the difference between destructive and non-destructive editing in Photoshop CS3. In this free video sample you'll learn how to edit an image in a non-destructive way, how to use the adjustment layers for non-destructive editing, and how to work with the layers palette. To redeem our exclusive discount coupon for Total Training products, use promotion code save20pss. You could save hundreds of dollars. Use this special link to see the full offer. xTrain has given us a super free clip for you to enjoy. This is the entire Class 5 of Photoshop CS3: Simplified and Easy with Ben Willmore. In this 22 minute training video, Ben demonstrates in detail some new selection techniques you can use with the Photoshop CS3 Quick Selection tool. Launch Class 5 - Quick Selections Tool: Photoshop's Coolest NEW Tool! Here's more info on this training, and if you decide to enroll, at checkout enter our exclusive discount promo code photoshopsupport and you'll receive an instant 15% discount on any and all xTrain products. Photoshop gives you the opportunity to turn your images into masterpieces. In Photoshop CS3: Simplified and Easy, Ben Willmore, Photoshop guru, guides you through the fundamentals of this essential imaging software. This course is easy enough to follow for beginners, but also is great for those who have used this software, and want to learn the the newest CS3 features. You will be taken through all the basics of Photoshop, and watch Ben go step by step through the numerous capabilities of this fun and essential software. Learn layer basics, enhancements, and editing. Class 4 will train you how to put together all you have been taught. This course will enable you to use Photoshop CS3 skillfully and extensively. For more information about xTrain, visit www.xtrain.com. They also have a free preview page with some samples. And remember  at checkout enter the promotional code photoshopsupport and you'll receive an instant 15% discount. The following videos are from Photoshop CS3 Extended Essentials. Learn how to use the amazing black and white conversion tools in Adobe Photoshop CS3. This new tool makes turning a color photo into a stunning black and white photo easy. This sample video clip from features a quick review of one of the new tools added to Photoshop CS3 - the Count Tool. This sample video clip features a quick review of how to work with brushes to paint digitally in Photoshop CS3. This sample video clip focuses on how to work with Smart Objects in Photoshop CS3. Learn how to use the Photoshop CS3 Unsharp Mask in this quick tutorial. Also learn how to use the Smart Sharpen filter. A quick tour of color correcting a photo in Photoshop CS3, including an advanced, sophisticated technique. Also shows how to easily remove red eye with Photoshop CS3. A quick look at doctoring an image in Photoshop CS3 by using the Spot Healing Brush Tool. A quick look at using different tools in Photoshop CS3 to create quick special effects  in this case an intense, vibrant blue vortex of light. A quick review of Adobe Bridge CS3 and some of its many powerful features. By generating web pages directly from Photoshop, you'll be able to spend much more time on the creative end of the spectrum, since you'll know right off the bat how well particular designs will translate to the web. No more going back to the Photoshop drawing board after getting a phone call from your development team, telling you that what you had envisioned doesn't have a chance of being displayed on the web. You can immediately visually and interactively test your designs, which permits you to then make changes to either esthetics or functions while it's still relatively early on in the design process. Adobe Photoshop CS3 comes with powerful new features with huge payoffs. But it can be overwhelming to learn, even for professional photographers, graphic designers, keen amateurs, and others who already have an initial grasp of Photoshop. Acclaimed photographer Martin Evening makes it easy with this new, thoroughly updated edition  Adobe Photoshop CS3 for Photographers: A Professional Image Editor's Guide to the Creative use of Photoshop for the Macintosh and PC. 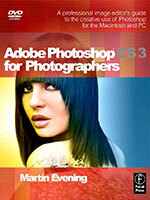 See our Photoshop CS3 Books Page for more Photoshop CS3 books.